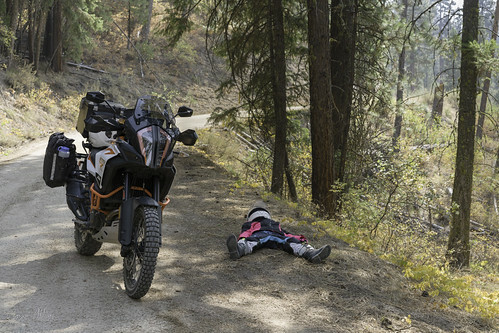 I didn’t want the ride to be only highway and gravel roads so we’ve turned up Pine Creek right after Idaho City and then onto arbitrary forest roads that go generally the right direction, toward Rabbit Creek Road. I plotted a route but haven’t yet added a device mount to the 1290 to see it as we go. There are too many intersections to stop at each one and pull out the phone so we’ve gone a bit aimless. Brenna says her buns are getting sore. “Then I can’t hold on,” she demurs. “Hold on to my shoulders,” I propose. Riding aimlessly isn’t working so well so we stop to look at the map long enough to memorize all the turns we need to get to camp. Brenna lies on the ground the whole time as a subtle hint she’s ready to be there.